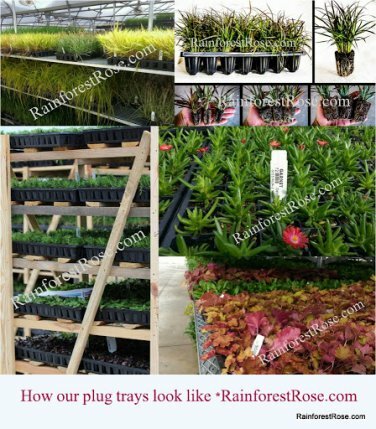 Licensed Nursery Rainforest Rose presents Cacti, Succulents, Perennial Plants and Ornamental Grasses. Our plants are products of USA. Featured in best-selling wedding book, Bridal Bargains. Need a different plant or color? We will be happy to check availability for you. View our CATALOGS: Perennials, and Ornamental Grasses. All starter plants will be the same variety or color. Plants are sold by tray, they cannot be split or mixed with other varieties. Grown in a standard 10" x 20" tray. Each plant has roots established in plug/soil. Plug will keep the roots intact, so there will not be any transplant shock. PEST FREE plants from CERTIFIED NURSERY. Tray size: 10" x 20" included. Pots are not included. 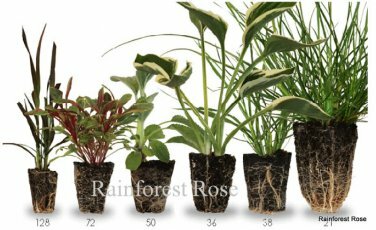 Starter plant height: varies. Remember these are starter plants, not matured plants. See picture below to get an idea. Processing time: 5 to 10 business days + UPS 2-4 days. All orders placed between Monday and Thursday will be shipped on the following Monday. Orders placed between Friday and Sunday night will be shipped on the second Monday following. Orders will be shipped via ground or express service based on your location. Delivery takes 4 days maximum from ship day. Request delivery date: if you will go on vacation, request your preferred delivery date in your order on "Note to Seller". How many plugs you will get is stated in title. Larger plugs means bigger plants. 72 cell tray Depth 2.4" x Width 1.6"
50 cell tray Depth 2.3" x Width 1.9"
36 cell tray Depth 3" x Width 2.1"
38 cell tray Depth 3" x Width 2.2"
21 cell tray Depth 4" x Width 2.7"
50 states in the USA. Arizona, Hawaii and Alaska residents must pay shipping surcharge $30 (will be invoiced separately).We cannot ship to PO Box address. Understandably NO RETURN, no refund, no exception. Items are as described, sold as is. We are very strict on this policy, thank you for understanding.